Takeitha Warner, 13, right, and her brothers JaMarcus, 14, and JaTavious, 17, are seen in this undated family handout photo. The siblings and three other teens drowned on a family outing Monday, Aug. 3, 2010, in northwest Louisiana?s Red River. None of them could swim. Six teenagers from two families drowned Monday in Shreveport, La. 's Red River while trying to save a friend who had slid into deeper waters. Those who drowned were the Warners: Takeitha, 13; and her brothers, JaMarcus, 14; and JaTavious, 17. 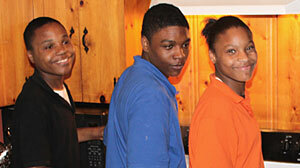 Their cousin, Dekendrix Warner, 15, was rescued. The others killed were the Stewarts: Litrelle, 18; LaDarius, 17; and Latevin, 15. "I didn't see my daughter, but I could see my two sons saying, 'Help me, please,'" said Maude Warner, mother of Takeitha, JaMarcus and JaTavious. The teenagers had been in a popular recreational area where sandbars give way to 20-foot depths. Neither the teenagers nor the adults watching from the riverbank could swim. "They had one life jacket here," said Cindy Chadwick, a spokeswoman for the Caddo Parish Sheriff's Office. "As you can imagine, everybody started yelling for help. Nobody could swim." Drowning is the second-leading cause of unintentional, injury-related death for people younger than 19, according to the American Academy of Pediatrics. Black children drown at a rate more than three times that of white children, according to the Centers for Disease Control and Prevention. The teenagers who drowned Monday were black. Dekendrix Warner was wading close to the shore when he slipped on a slick, clay surface and fell into deeper water. The other teens rushed to help him and were overcome, authorities said. The bodies have been recovered, Shreveport Assistant Fire Chief Fred Sanders said. "According to the divers," Shreveport Fire Chief Brian Crawford said, "there was about 12 to 15 feet of water that slowly graded off from ankle depth to about three feet. It's very slippery and so if you start hitting that bank and you start slipping down that bank, it's very hard to find traction." "If you don't have a swimming capability, you could find yourself slipping down that angle all the way to the 28 feet at the bottom of the river," he said. Marilyn Robinson, a friend of the families, told the Times of Shreveport that she watched helplessly as the victims went under. She said a large group of family and friends, including about 20 children, were at the sandbar to barbecue. She said they were familiar with the water. "None of us could swim," she said. "They were yelling, 'Help me, help me. Somebody please help me.' It was nothing I could do but watch them drown, one by one." "It's devastating," Sanders said. "To my knowledge, the city has never experienced an incident of this magnitude." "You can imagine watching your child drowned and not being able to do anything," Crawford said. While 40 percent of white children were found to have low or no swimming ability, the same was true for nearly 70 percent of black children, according to a recent survey by USA Swimming, the governing body of competitive swimming in the United States. Latino children also lag behind in their swimming levels, with 58 percent at low or no swimming ability. Experts cite several possible explanations why blacks show less of a proclivity for swimming. For one thing, black children with parents who themselves do not know how to swim are less likely to know or to be encouraged to learn how. Also, blacks say a lack of access to pools, the expense of swimming lessons and the idea that recreational swimming is a culturally white activity are factors that inhibit them from learning how to swim, according to the USA Swimming study. Cullen Jones, the first black Olympic gold medalist in swimming, is traveling around the country this summer to promote swimming and minority children. He said most of his family members and friends did not know how to swim when he was growing up. He said his father knows how to swim but his mother doesn't. After Jones nearly drowned at the age of 5 while at an amusement park, his mother got him lessons. "I think a large part of it is generational. I think a lot of times parents don't know how to swim. They don't think it's a big enough idea. It's a really big problem when it comes to the summer," Jones said. "But I'm calling to most parents to understand that we really need to get our kids water safe." The most common reason cited by blacks for not knowing how to swim, however, was a fear of drowning. The USA Swimming study was conducted by the University of Memphis between Feb. 1, 2010, and May 26, 2010, and surveyed more than 2,000 children and parents at YMCAs in six cities across the United States -- in Atlanta, Boston, Denver, Memphis, Minneapolis and San Diego. "We were awestruck by the focus group participants' stories, which revealed how deeply rooted the 'fear factor' is embedded," said Richard Irwin, who led the team of researchers together with his wife, Carol Irwin. "Using solutions outlined by our focus groups and some minority swimming programs already in place, we can positively affect the ... drowning rates and infuse the sport of swimming with much-needed diversity," Carol Irwin said. ABC News' Suzan Clarke and Sabrina Parise contributed to this story, which was supplemented by Associated Press reporting. How Did 6 Black Teens Drown at Once? +Are You Swimming in Filth?